Andorra is open to international trade offering advantageous possibilities for international suppliers and exporters. Despite not being a member of EU, Andorra is treated as a member of European Union in connection of trading manufacturing goods, but as a non-EU member as to agricultural goods. There are no customs duties in Andorra. This factor makes the country in question easily accessible for importers and exporters as there are no trade barriers. Consequently Andorra has become an important international hub of retail trade attracting millions of shoppers from all over Europe and many countries of the world. It should be noted that Andorra imports much more than it exports. The top trading partner of the country is the EU, especially Spain and France. Main exports of Andorra include cigarettes and cigars, mineral water, furniture and postage stamps. Looking for trustable suppliers or planning to enter a new market? Export Portal is one of the largest searchable B2B platform of global manufacturers, suppliers, exporters and importers. Find the latest products from reliable Andorra manufacturers and suppliers. Andorra is very open to international trade. Tourism, retail sales, and finance are the mainstays of Andorra's tiny, well-to-do economy, accounting for more than three-quarters of GDP. 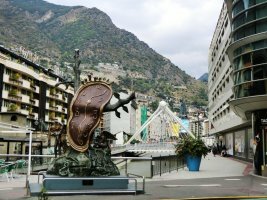 Andorra's duty-free status for some products and its summer and winter resorts attract millions of visitors annually, although the economic downturn in neighboring countries has curtailed the number of tourists. Andorra has a status of a low tax and duty-free zone country. These factors have led to the development of trade in consumer goods. Currently, foreign trade along with tourism represent the major components of the economy of Andorra. However, Andorra's exports are a relatively minor activity as opposed to the level of imports. Since the late 1990s, imports of products into the country exceeded exports about twenty-fold. Top products imported by Andorra include passenger vehicles, non crude oil, cell phones, beauty and make up products, cane sugar, perfume, furniture, motor vehicle parts and food. If you are looking for Andorran business partners, suppliers, exporters or exporters, visit Export Portal, one of the largestworldwide portal for Importers and Exporters. Source quality products made in Andorra or find reliable Andorra wholesalers, manufacturers and exporters. Andorra, officially the Principality of Andorra, is a sovereign landlocked microstate in Southwestern Europe, located in the eastern Pyrenees mountains and bordered by Spain and France. Andorra is a member of the Council of Europe, United Nations Conference on Trade and Development, World Customs Organization, World Trade Organization (observer) and other international organizations. Andorra is very open to international trade and it offers advantageous fiscal legislation. In spite of not being a member of the European Union, the country is treated as an EU member in terms of trading manufacturing goods (without applying customs duties). Customs duties do not exist in Andorra, the country is easily accessible. There are no trade barriers in Andorra. This has made of Andorra an important international center of retail trade that attracts millions of shoppers from all over Europe. No regulations other than those of France or Spain, whichever must be transited to reach Andorra. Andorra itself is duty free. Andorra applies the EEC common external tariff for imports from third countries, while trade between the EEC and Andorra is free of customs duties. Agricultural products are subject to import duties, but products of Andorran origin are exempt from EEC duties. Commercial trade is still subject to domestic indirect taxation. The name and full address of the consignor. The name and full address (incl. phone number) of the consignee. A number and date of issue of the invoice. EORI number from the consignor. A clear description of each item. A commodity code per item. An amount reference per item. A value per item and the total value for the entire shipment. - Standard DPD incoterm: DAP cleared. If another incoterm is applicable is has to be clearly mentioned on the invoice. It’s mandatory to mention the final destination with each incoterm. - Each shipment to Andorra has to be accompanied by an “Autorizacion de despacho y representación’’ document which has been filled in by the consignor.